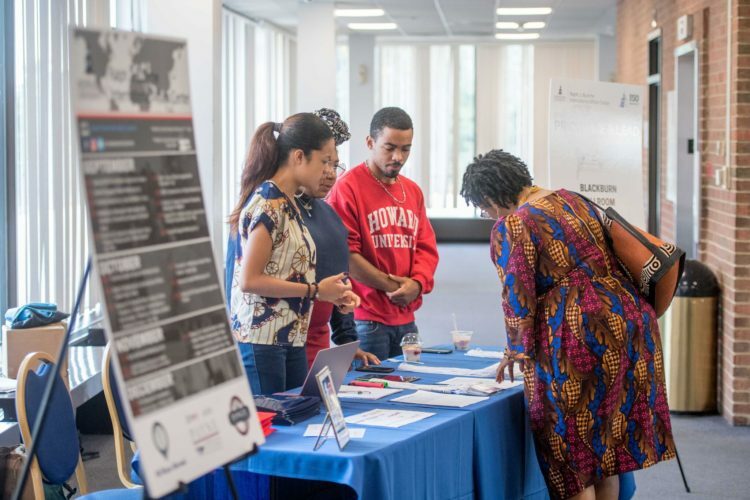 The Bunche Brigade is a volunteer group of students who are interested in all things global and committed to increasing the number of Howard University students who study abroad! All members of the Brigade promote global education across campus and especially the activities of the Bunche Center. The joy of being involved in the AMAZING Bunche Center activities! The opportunity to design your own events. The opportunity to engage with fellow students about your experience abroad and get them excited about what awaits them! Be the first to know about international opportunities (scholarships, fellowships, jobs, internships, etc.) before the rest of campus. And a cool t-shirt too! Must be able to spend time on a weekly basis at the RBC. Must be available to participate in RBC activities like new student orientation, Accepted Students Day, admissions open houses, study abroad fairs on campus, and other RBC events. Do you have to have studied abroad to join? NO! Anyone who has an interest in the globalization of Howard University campus is welcome to join. Can I become a member even though I don’t want to study abroad? Of course. Whether you are considering study abroad or are unsure about studying abroad but wish to learn more, the BB welcomes you.